The original promise of digital music distribution was supposed to be greater variety, the availability of out-of-print music, communities serving specific interests that had been under-served by mass culture, high-quality audio, and lots of choice. Slowly, I think, that promise is finally being delivered. Readers of a music technology site may not think much about Josquin motets (well, actually, I do, though I don’t know if I’m typical). But we have talked about a gradual shift away from mass-market, proprietary distribution as with the original iTunes Music Store to more choices of stores, DRM-free music that’s mobile across devices, and, most importantly, more choice in music. What’s amazing is how this trend is accelerating. The store is truly international: No, really international. Not the US and Canada international. The store will sell to 42 countries, and will extend to Southeast Asia including China, India, Latin America, South Africa, and Central and Eastern Europe including Russia. Two words: ’bout time. There’s real variety: In a genre badly abandoned by an entire industry recently — long before Napster, in fact — DG has put up a serious catalog. And in a big change, instead of publishing a subset of their current catalog, they’ve actually re-released “out-of-print” albums. Lest you think I’m shilling for UMG, they’ve released a couple of my personal faves I only had access to on vinyl, and made contemporary music far more accessible. Big player, small market: It’s owned by UMG, so this is no indie label — in fact, on the contrary, it’s encouraging to see a big media company let the niche division move forward instead of focusing on what’s popular in the mass market. CDM: I was really excited to see albums re-released that were out of print … what kinds of albums fit into this category? What sorts of music might you anticipate releasing in this way in the future from DG’s back catalog? JB: The out of print albums now available on the DG Web Shop are from all across the wide spectrum of the DG catalog, including everything from one of the best ever Beethoven 5th Symphony interpretations from Carlo Maria Giulini and the LA Philharmonic; to wonderful Josquin Des Prez motet recordings, performed by the Orlando Concert; to Mozart Symphonies by the Orpheus Chamber Orchestra; to tango albums by the latest generation of Buenos Aires musicians; the list goes on. Subsequent to the launch, approximately 1,000 “out-of-print” [albums] could be made available – DG will continue to digitize and to mine the archives for the best gems from its catalog, dusting them off for the download medium. CDM: Classical music in general has suffered in sales, which has reduced new releases and back catalog choices, which reduces sales, and so on. So it’s perhaps even more encouraging to see classical distribution online in this way than other genres, especially with an enthusiast audience. What do you think this may mean for classical music fans? JG: Our overall goal is to make classical music available to music lovers wherever there may be, whenever they want to experience it – anytime, anywhere and always in the best possible audio quality. This has been DG’s tradition – and will be its future. In addition, we are convinced that we will attract a wider range of consumers, including the growing global downloading community that is open-minded to various styles of music – including classical music. 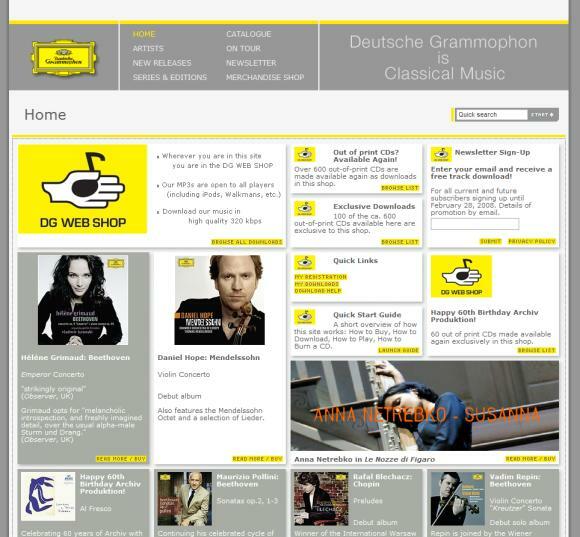 The DG portal and Web Shop will be an entry door for them as well as a home to the existing classical music community. This group, for instance, feels more comfortable searching and making their choices online than being “overstrained” in a CD store, where the selection is either too much – which can be overwhelming – or too little. We need to do all we can to help these customers to find and then to pick the best music. For everyone from the classical enthusiast to explorer to novice, the DG Web Shop brings high-quality audio, metadata/tagging, and search information to the world of classical music downloading – it will encourage, we hope, those who have not tried downloading yet to take the plunge; and those who have not explored classical music to do so online. What’s more, aside from downloading, the DG web site offers, now more than ever before, a tremendous resource of information on the tour activities of our artists, links to the artist web sites, to venues, opera houses and so on. It is a perfect place to start an exploration into the world of classical music. CDM: Contemporary music has been even harder to find than classical music, especially here in the US. Will this store address contemporary music fans? JG: Yes – the outstanding DG “20/21” series featuring all contemporary music is to be found in the shop, as are the recordings of contemporary composers like Osvaldo Golijov. We agree and have found that contemporary music benefits tremendously from online exposure. Plus, if you want to try just a bit of the music, to see what it is like, you can download individual tracks regardless of length on the DG Web Shop. What went into the decision to choose 320 kbps? (That is, how do you decide between, say, 256 kbps and 320 kbps?) Are these VBR or CBR 320 kbps? We wanted to get the balance right between the highest-quality encoding possible without sacrificing too much in terms of the download speed or interoperability issues that can come with other formats, so we went with CBR 320 kbps MP3. Another issue with classical music on the mainstream, big bucket online stores has been difficulty searching for music and managing downloaded music because of poor metadata / tagging. What kinds of things will DG’s store offer that these outlets have not? I got a chance to play a bit with the new store. I have to say, as Web design goes, I’m not terribly impressed: navigation tools are scant, which is too bad — browsing can be as much fun as surfing, even online. But in terms of the product itself, the new site delivers. Pricing ranges from $/â‚¬1.29 for a full-length track to $/â‚¬11.99 for an album. There’s none of the bizarre, arbitrary pricing you find on sites like iTunes in the classical section. You can buy whole pieces, you can buy whole albums. Albums often come with PDF e-booklets, as well — it’d be great to see these standard, but at least many of the albums have them (almost none on iTunes do). This is the first time, I have to admit, that I’d think of buying classical and new music in electronic format. I hope DG continues to expand this, and builds in better browsing. So, what’s the bigger picture? I do think this relates to far more than just DG and classical music. The trend I see: just as Napster motivated the music industry to take notice of digital distribution, Apple’s singular success with iTunes and iPod — and the control it affords Apple — could motivate labels to build better stores of their own. And there’s no way not to see that as a healthy trend. Sure, Universal’s CEO may be ranting about Coca-Cola and Li’l Abner metaphors, but his company is shrewdly making aggressive moves to connect music with listeners. That was, after all, the business they were supposed to be in the first place.